We thank you most sincerely for your prayers and your kindness to our work in the past, and we ask you to continue your wonderful help into the future. May this year be filled with God’s blessings for you and those you love. Thank you! 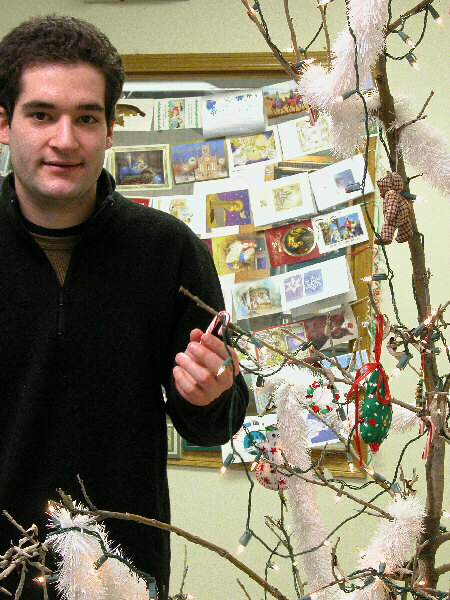 TREE’S A CROWD: (left) Volunteer music director Clinton White hangs a small candy cane onto the KNOM studio’s Christmas tree. It’s actually a willow shrub, one of many varieties that grow in the Arctic like weeds. In treeless Nome, many families use these little trees, rather than go to the high expense of shipping an evergreen by air. This particular eight-footer was growing out of the building pad of the cold storage building behind the radio station. It’s a little on the bare side, but the price was right and it provided the KNOM staff great cheer during the Christmas season. RECEIPT: In mid-January, we will be mailing a receipt to each person who contributed a total of $250.00 or more to our mission during 2004. We will be happy to mail a receipt to anyone who wishes one, regardless of the amount. Just drop us a line. We also welcome questions, comments and inspirational spots! GREETINGS! In our 9th annual Christmas greeting program December 17th, over three hundred listeners offered holiday wishes to about six thousand people. Tom Busch and Ric Schmidt hosted the seven-hour program, with Ric, Lynette Schmidt, Amy Flaherty and Katie Ringenbach screening calls. KNOM is the oldest Catholic radio station in the United States, a valuable service that thousands of people depend on every day, thanks to you. INSPIRATIONAL SPOT: You can’t trust the Good Shepherd until you first become one of His sheep. WARMING THE BENCH (left): General manager Tom Busch, who’s again serving as engineer these days, tests power supplies for our village translators. Recently, this little collection of gear has been occupying a corner of the work bench in the station’s engineering room. The small 10-Watt transmitter is at lower right, audio processors are in the center, and at rear left is a battery and trickle charger. Immediately in front of Tom are two test meters. 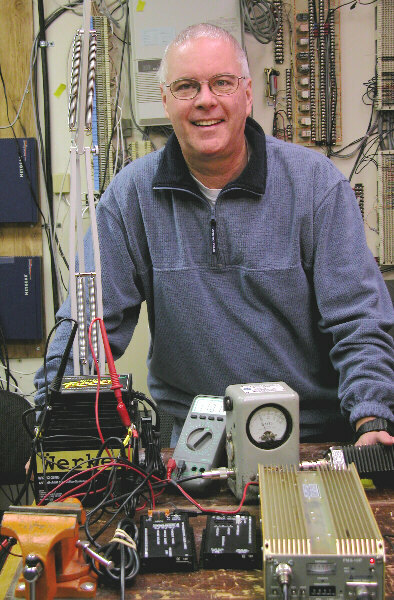 In late spring, Tom plans to begin installing these little transmitters in eleven distant villages. Provided KNOM’s programming by AT&T satellite, they will provide these remote points a clear signal. For a couple of these places, it will be the first easily heard radio ever. We estimate that these devices will increase KNOM’s listenership by about 50%. AN AUSPICIOUS BEGINNING: December 1st saw the debut of a new educational spot series on KNOM, produced by public affairs director Amy Flaherty. Titled “Alaska Native History Day by Day, a Reference in Time,” it’s based on a book by the native group Cook Inlet Region, Inc., using the material with their permission. Initially, Amy is producing one every two weeks. An attainable goal is to produce 108 of them, allowing for a fresh spot each week, repeating only every two years. ON BEHALF of the KNOM staff, especially the volunteers, thank you so very much to everyone who went out of their way to send Christmas goodies. It is wonderfully warming to know that we are remembered, especially for those of us who are thousands of miles from home. PRAYER REQUESTS: Many of our contributors have sent us requests for prayer recently. We thank you deeply for your kind prayers on our behalf. Will you please add the intentions of our mission’s many benefactors to your daily prayers, also? INSPIRATIONAL SPOT: Taking up our cross means the acceptance of what is � often quite against our wills � inflicted upon us. But we take it with an openness to the possibility that out of that affliction, a blessing can be extracted with a little imagination and with God’s grace. INSPIRATIONAL SPOT: Lord, guide my steps in ways of grace�- that they may ever be in harmony with the music to which You have set this world. THIS IS ONLY A TEST: Volunteer KNOM archivist Anna Dummer was all decked out in Nome Volunteer Fire Department gear, participating in a December drill of Nome emergency responders. The exercise was conducted at Nome’s junior/senior high school. Over 500 miles from the nearest city and often unreachable due to bad weather, Nome needs an expertly trained group of volunteer professionals to handle fires, floods and other disasters. Earlier last year, Anna joined the volunteer fire department and holds the rank of Firefighter. SPOT-LIGHT: Educational spots on the air in December dealt with a range of topics, including: alcohol and aging, youth education and opportunities, quitting cigarettes and chewing tobacco, diet and exercise, elder wisdom, diabetes prevention, hypothermia, child Internet safety, AIDS prevention, carbon monoxide poisoning prevention, history, science and mental health tips. Thank you for making the 34,000 educational spots that KNOM broadcasts each year possible. “WARM GLOBALLY, SWIM LOCALLY” is the title of another Andrew McDonnell-penned KNOM Christmas play, skillfully produced by KNOM volunteer production director Liz Recchia. It was a truly global collaboration, made possible by the Internet. Andrew, a 2000-02 KNOM volunteer, is teaching English in Saipan, in the Northern Mariana Islands, about 3,500 miles away. Still, he’s a hundred miles closer than last year, when he wrote the station’s award-winning Christmas play from Bangor, Maine. We prayerfully place all bequests into funds that are used only for major improvements or to help the mission during emergencies. God bless you! WHITE OUT: (left) It began suddenly. At 11 PM on Christmas Eve, the air filled with snow and the wind picked up to a strong gale. The storm roared and howled all night, and into Christmas Day, easing up by about suppertime. 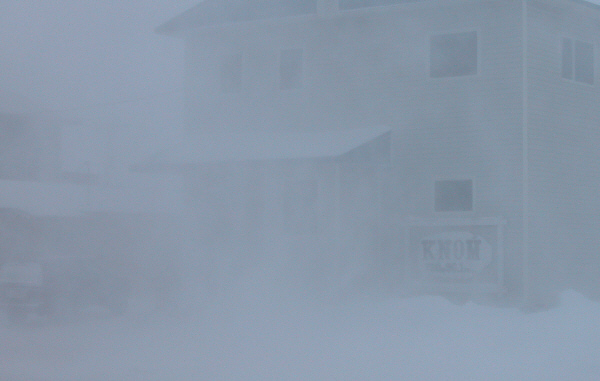 This picture shows what the KNOM studio looked like from directly across the street at about 2:30 PM Christmas Day. It was a good day to stay inside. And stay inside people did, thanks to advance notice of the severe conditions. Christmas Eve, KNOM broadcast an average 10 minutes of weather bulletins and warnings every hour to prevent travelers from getting caught in these life-threatening conditions, particularly people snowmobiling between villages. THIRTY YEARS AGO: In January 1975, KNOM volunteer news director Steve Havilland covered the 50th anniversary reenactment of the 1925 serum run, when 21 dog mushers and their teams relayed life-saving diphtheria serum over 674 miles of trail to Nome. 1975’s event was far less critical, but Steve had a job on his hands, as it was extremely difficult to develop information due to the lack of communications facilities in rural Alaska. MAKING BOOK: Tom Busch is working hard to complete “Highlights of KNOM History” by the middle of this month, though “February is more realistic,” he says. He is using a computer program to typeset the work page by page. The event-filled book will have dozens of pictures and inspirational spots, and will include a list of every person who has volunteered for the mission since 1966, 392 individuals up to this point. It will probably span about two hundred pages. We’ll keep you in touch with progress. This New Year’s, we renew our pledge that we will never provide your name and address to anyone, for any reason. We pledge that we will use your gifts carefully and prayerfully. And we pledge that you will remain in our prayers. We thank you once more for your thoughtfulness to our work. God bless you abundantly! INSPIRATIONAL SPOT: Forgiveness is the perfume that the trampled flower casts back to the foot that crushed it.